ISO 9001:2008 Manufacturer for Plastic Film Capacitors. Why not change the units to be better sizes in Electronics? It might seem a good idea to make the farad (F) much smaller to avoid having to use µF, nF and pF, but if we did this most of the equations in electronics would have to have factors of 1000000 or more included as well as the quantities. Overall it is much better to have the units with their present sizes which are defined logically from the equations. but you could use volt (V), milliamp (mA) and kilo-ohm (kΩ) if you prefer. Take care though, you must never mix sets of units: using V, A and kΩ in Ohm's Law would give you wrong values. The unit (and unit symbol) which is used to measure each quantity. For example: Charge is measured in coulombs and the symbol for a coulomb is C.
Some of the units have a convenient size for electronics, but most are either too large or too small to be used directly so they are used with the prefixes shown in the second table. The prefixes make the unit larger or smaller by the value shown. The table shows electrical quantities which are used in electronics. To prevent confusion we normally use the same symbol (letter) for each quantity and these symbols. Please click on the quantities in the table for further information. * strictly the unit is ampere, but this is almost always shortened to amp. Electrolytic capacitors are now being used increasingly in SMD designs. Their very high levels of capacitance combined with their low cost make them particularly useful in many areas. Often SMD electrolytic capacitors are marked with the value and working voltage. There are two basic methods used. One is to include their value in microfarads (m F), and another is to use a code. Using the first method a marking of 33 6V would indicate a 33 mF capacitor with a working voltage of 6 volts. An alternative code system employs a letter followed by three figures. The letter indicates the working voltage as defined in the table below and the three figures indicate the capacitance on picofarads. As with many other marking systems the first two figures give the significant figures and the third, the multiplier. In this case a marking of G106 would indicate a working voltage of 4 volts and a capacitance of 10 times 10^6 picofarads. This works out to be 10 mF. jbcapacitorsis thespecialty manufacturer of the SMD Electrolytic capacitor.Ourjb capacitorshave JCS - 2000H at 85°C SMD Aluminum Electrolytic Capacitor and JCK - 1000H at 105°C SMD Aluminum Electrolytic Capacitor. 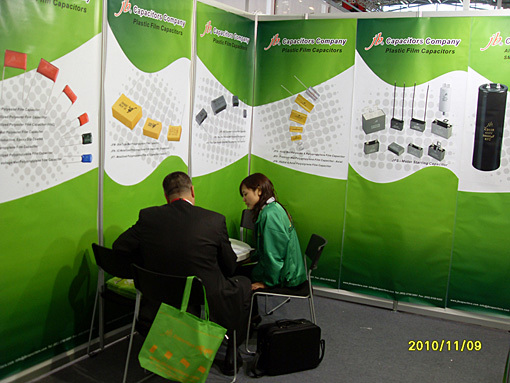 On Nov 9th~12th,2010, jb Capacitors Company exhibit at Electronica 2010 in Munich, Germany. 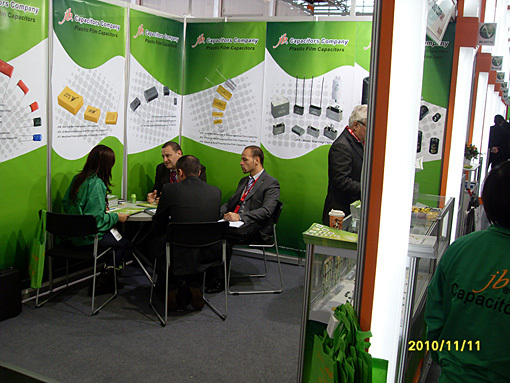 Below you can see our green booth photos. Our booth are very popular, many customers visited our booth with great pleasure. Our exhibition are very successful. On the show, we exhibit below, also welcome to contact our sales if you are interested in our leafletes, sample kits, and green bags, and samples. The table below gives and overview of the main characteristics of the various types of capacitor. 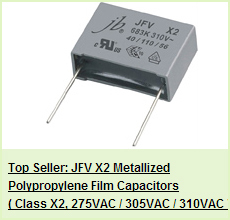 Electrolytic 0.1 µF - ~1 F V poor V poor Poor Polarised capacitor - widely used in power supplies for smoothing, and bypass where accuracy, etc is not required. Ceramic 10 pF - 1 µF Variable Variable Average Exact performanceof capacitor depends to a large extent on the ceramic used. Tantalum 0.1 µF - 500 µF Poor Poor Poor Polarised capacitor - very high capacitance density. Silver mica 1 pF - 3000 pF Good Good Good Rather expensive and large - not widely used these days except when small value accurate capacitors are needed. Polyester (Mylar) 0.001 µF - 50 µF Good Poor Good Inexpensive, and popular for non-demanding applications. Polystyrene 10 pF - 1 µF V good Good V good High quality, often used in filters and the like where accuracy is needed. Polycarbonate 100 pF - 20 µF V good V good Good Used in many high tolerance and hash environmental conditions. Supply now restricted. Polypropylene 100pF - 50 µF V good Good V good High performance and low dielectric absorption. Teflon 100 pF - 1 µF V good V v good V v good High performance - lowest dielectric absorption. Glass 10 pF - 1000 pF Good Good V good Excellent for very harsh environments while offering good stability. Very expensive. Vacuum and air 1 pF - 10 000 pF Often used as variable capacitors in transmitters as a result of their very high voltage capability. 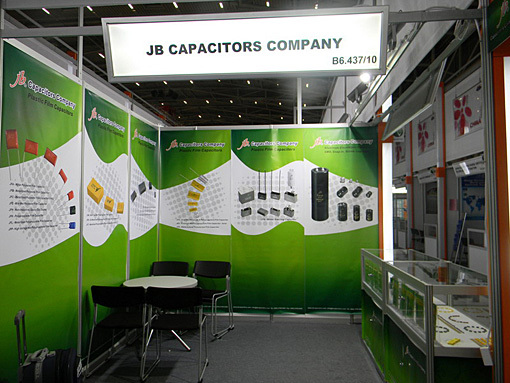 Welcome to visit our jb capacitors website http://www.jbcapacitors.com/ to search your interestedcapacitors. It is necessary to quantify a capacitor in terms of its ability to store charge. The basic unit of capacitance is the Farad, named after Michael Faraday. The definition of A Farad is: A capacitor has a capacitance of one Farad when a potential difference of one volt will charge it with one coulomb of electricity (i.e. one Amp for one second). Start capacitors briefly increase motor starting torque and allow a motor to be cycled on and off rapidly. Start capacitors have ratings above 70 microfarads (µF), with three major voltage classifications: 125 V, 250 V, and 330 V. A start capacitor stays energized long enough to rapidly bring the motor to 3/4 of full speed and is then taken out of the circuit, such as by a centrifugal switch that releases when rotating at or around that speed. 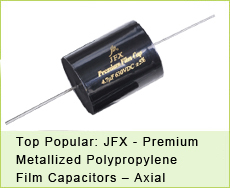 Examples of motor capacitors are: a 35 µF, at 370 V, run capacitor, or an 88–108 µF at 250 V start capacitor. 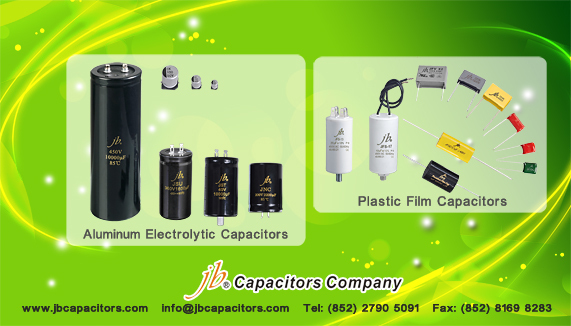 jb have the motor starting capacitors of capacitance range 1uF~20uF(JFS-A~D、JFS-5~7、JFS-9) 1uF~100uF(JFS-11~18). The capacitance of certain capacitors decreases as the component ages. In ceramic capacitors, this is caused by degradation of the dielectric. The type of dielectric and the ambient operating and storage temperatures are the most significant aging factors, while the operating voltage has a smaller effect. The aging process may be reversed by heating the component above the Curie point. Aging is fastest near the beginning of life of the component, and the device stabilizes over time,electrolytic capacitors age as the electrolyte evaporates. In contrast with ceramic capacitors, this occurs towards the end of life of the component. 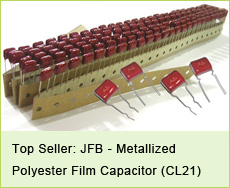 Our jb capacitors has various capacitance.Such as our JFA-Mylar Polyester Film Capacitors, capacitance range from 0.001 to 0.47μF.